*Restrictions apply. Toyota & Scion vehicles only. See participating dealers for details. Offer ends 4/30/19. $25 Prepaid Card With Brake Pad Purchase & Installation. Restrictions apply. See dealer for details. Offer valid thru 4/30/19 on Toyota Complete Maintenance Care brake pads or OEM brake pads if a TCMC brake pad is not available for the vehicle. Brake pads must be installed by authorized dealer. Additional parts may be needed. Offer excludes all applicable tax, installation costs, and previous purchases. Not valid with any other offer or advertised special. Toyota and Scion vehicles only. Void where prohibited. For $25 prepaid card, original redemption form required. Photocopies will not be honored. Rebate submissions must be received by 5/30/2019. Please allow 6-8 weeks for receipt of your card. Please retain copies of the materials you submit. No responsibility for late, lost, illegal, misdirected, or incomplete submissions. To check the status of your rebate, visit www.checkyourrebate.com/Toyota or call 855-302-4572. Does not include parts and fluids, except emergency fuel delivery. Valid only in the continental U.S. and Alaska. ToyotaCare is for New Vehicles only. ToyotaCare covers normal factory scheduled service for 2 years or 25,000 miles, whichever comes first. See Toyota dealer for details and exclusions. Valid only in the continental U.S. and Alaska. Does not include parts and fluids, except emergency fuel delivery. Valid only in the continental U.S. and Alaska. ToyotaCare is for New Vehicles only. Every eligible new Toyota comes with a maintenance plan that covers you for up to 2 years or 25,000 miles, whichever comes first, at no cost. 4 Years 3 or 45,000 Miles(whichever comes first)Coverage of factory recommended maintenance 5for your 30,000, 35,000, 40,000, and 45,000 mile services. 4 Years 3 & Unlimited Miles 4(24-hour/7 days a week)Around-the-clock roadside assistance for when the unexpected occurs. You’re even covered if someone else is driving your Toyota. Covers normal factory scheduled service for two years or 25,000 miles, whichever comes first. See Toyota dealer for details and exclusions. Valid only in the continental U.S. and Alaska. Purchase of a ToyotaCare Plus agreement is optional, cancelable (see agreement terms) and not required to obtain credit. Available through participating Toyota dealers and Toyota Financial Services. Toyota vehicles are eligible if the vehicle was eligible for the no cost 2yr/25k ToyotaCare plan and if the odometer reads 31,000 miles or less, and is within 37 months of date of first use. Date of first use is when your new vehicle is first put into service. Vehicle is considered new at date of first use if vehicle has 799 miles or less on the date vehicle was first put into service. Coverage of major and minor services varies by plan purchased. For complete program terms, conditions and restrictions, see your participating Toyota dealer or visit www.toyotafinancial.com/ppm. Product not available in all states. ©2019 Toyota Financial Services is a service mark used by Toyota Motor Insurance Services, Inc. and its subsidiaries. From the date of first use or 45,000 miles, whichever comes first. Date of first use is when your new vehicle is first put into service. Vehicle is considered new at date of first use if vehicle has 799 miles or less on the date vehicle was first put into service. Consult the vehicle's Maintenance Guide for factory recommended service and intervals. Service requirements and intervals vary by model. Excludes those items listed in the Maintenance Guide under Special/Severe Operating Conditions. Transferability: Coverage can be transferred once from the original owner to a private party; this excludes dealers. A $50 transfer fee applies. Cancellation: You can cancel ToyotaCare Plus within 30 days after the expiration of the manufacturer's maintenance program for a full refund if no benefits have been paid. If benefits have been paid, or if you are canceling after this point, please ask your dealer or refer to your agreement. Covers normal factory scheduled service for two years or 25,000 miles, whichever comes first. See Toyota dealer for details and exclusions. Valid only in the continental U.S. and Alaska. Purchase of a ToyotaCare Plus agreement is optional, cancelable (see agreement terms) and not required to obtain credit. Available through participating Toyota dealers and Toyota Financial Services. Toyota vehicles are eligible if the vehicle was eligible for the no cost 2yr/25k ToyotaCare plan and if the odometer reads 31,000 miles or less, and is within 37 months of date of first use. Date of first use is when your new vehicle is first put into service. Vehicle is considered new at date of first use if vehicle has 799 miles or less on the date vehicle was first put into service. Coverage of major and minor services varies by plan purchased. For complete program terms, conditions and restrictions, see your participating Toyota dealer or visit www.toyotafinancial.com/ppm. Product not available in all states. ©2019 Toyota Financial Services is a service mark used by Toyota Motor Insurance Services, Inc. and its subsidiaries. From the date of first use or 45,000 miles, whichever comes first. Date of first use is when your new vehicle is first put into service. Vehicle is considered new at date of first use if vehicle has 799 miles or less on the date vehicle was first put into service. Does not include parts and fluids, except emergency fuel delivery. Valid only in the continental U.S. and Alaska. Consult the vehicle's Maintenance Guide for factory recommended service and intervals. Service requirements and intervals vary by model. Excludes those items listed in the Maintenance Guide under Special/Severe Operating Conditions. Impaired tire will be replaced with your inflated spare. To the nearest Toyota dealership (or to the Toyota dealership of your choice within 25 miles of the nearest dealer). Extrication from any ditch, mud, sand or snow. Vehicle must be immediately adjacent to a regularly traveled road and capable of being serviced with standard servicing equipment. Transferability: Coverage can be transferred once from the original owner to a private party; this excludes dealers. A $50 transfer fee applies. Cancellation: You can cancel ToyotaCare Plus within 30 days after the expiration of the manufacturer's maintenance program for a full refund if no benefits have been paid. If benefits have been paid, or if you are canceling after this point, please ask your dealer or refer to your agreement. Maximum discount of $100. Discount good on vehicle service (parts & labor). Not valid toward any other advertised special. Excludes tires. One coupon per work order. Toyotas only. If discount applies, it will be taken off of the regular posted price. Must present coupon when order is written. Plus tax. Not valid with any other offer. Prior sales excluded. Valid only at Toyota of the Desert. Maximum discount of $100. Discount good on vehicle service (parts & labor). Not valid toward any other advertised special. Excludes tires. One coupon per work order. Toyotas only. If discount applies, it will be taken off of the regular posted price. Must present coupon when order is written. Plus tax. Not valid with any other offer. Prior sales excluded. 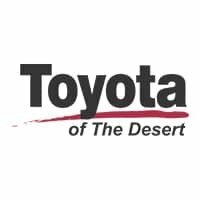 Valid only at Toyota of the Desert. Rough roads can take their toll on your vehicle. Some models additional. Stock rims only. Toyotas & Scions only. If discount applies, it will be taken off the regular posted price. Must present coupon when order is written. Plus tax. Not valid with any other offer. Prior sales excluded. Valid only at Toyota of the Desert. Some models additional. Stock rims only. Toyotas & Scions only. If discount applies, it will be taken off the regular posted price. Must present coupon when order is written. Plus tax. Not valid with any other offer. Prior sales excluded. Valid only at Toyota of the Desert. *Expires 24 months from date of purchase. Color-indicator formula detects the presence of acid. Neutralizes and cleans away acid and terminal buildup. Stops corrosion from forming at posts. *Present at time of write up. Valid at our retail parts counter only. One coupon per customer. No wholesalers. Not valid with other offers.